Prime Minister Ana Brnabić spoke today with Minister of European and Federal Affairs of the German State Hessen Lucia Puttrich about further improvement of relations and strengthening of provincial cooperation between the Autonomous Province of Vojvodina and Hessen. 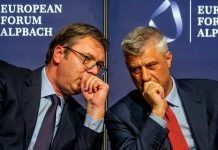 Brnabić informed Puttrich about the progress of the reform process Serbia is pursuing on its path to EU membership, especially in the area of the rule of law and the fight against corruption. Prime Minister pointed out that Germany is one of the most important partners of Serbia, both politically and economically, and estimated that this type of expansion of cooperation is aimed at further strengthening of relations of the two countries. Speaking about the stalemate in the negotiations between Belgrade and Priština, the Prime Minister pointed out that Serbia is ready to continue the dialogue as soon as tariffs on the import of goods from Serbia and Bosnia-Herzegovina are abolished. According to her, such unilateral moves of Priština are unacceptable, they jeopardise the process of normalisation of relations and negatively affect the stability of the entire region. Puttrich expressed support to Serbia on its road to EU membership and added that it is important that the Union show interest in Serbia’s membership more openly.